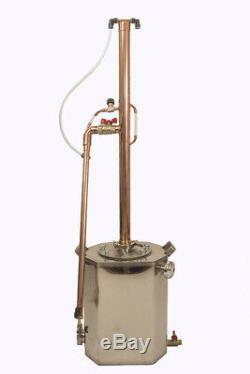 2 Reflux copper column Moonshine Home brew Still Distiller rectification. 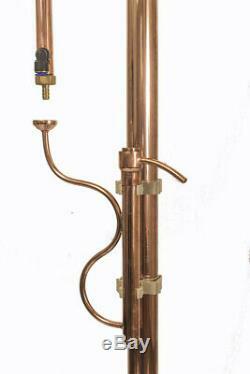 2 Reflux copper rectification column 96.4 Alcohol Distiller, Moonshine, Copper Whiskey Still. This column is a modern device for the production of a wide range of alcoholic beverages. This OKOVIT MECCANO PRIMA Liquid and Vapour management column was born after extensive research and testing different distilling and rectification technics by Oil and Gas University Chernowitz engineering team in West Ukraine. OCOVIT MECCANO PRIMA is an universal column that allows you to perform three main functions. Mash to raw alcohol distillation. Receiving alcohol neutral taste (ethanol fuel) with a strength of 96.4 degrees. You can operate this column in three modes. 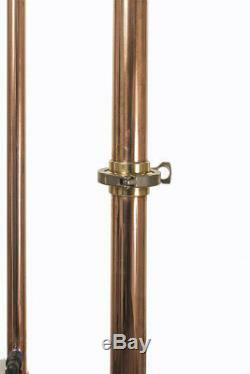 OCOVIT MECCANO PRIMA copper column comes with the 2 tri clamp and gasket for attaching the column to your still or Sanke type beer keg. The column also featured by reflux viewing tube which completely eliminates needing for expensive sight glasses as youll see reflux through it and adjust operation accordingly. This column is a capable of distilling 130 to 180 proof. The column fully compatible with our other OCOVIT MECCANO bloks such as boilers and full OKOVIT MECCANO SYSTEMS. 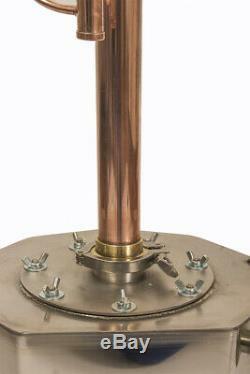 Unlike soldering, all joints in our copper columns are TIG welded using food grade DHP copper welding rod. 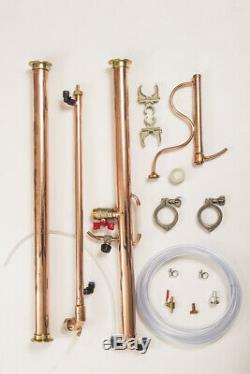 Made of food grade high quality copper our OCOVIT MECCANO PRIMA reflux column comprises of. 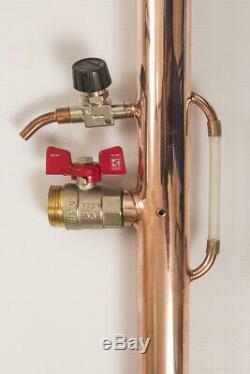 Copper 800 mm length column, fitted by Bokakob design collection point head (Vapour+Liguid management option), 2 clamp flange and removable (for easy cleaning) Dimroth type deplegmator on the top. A Plates inside the head to collect alcohol. B Needle valve for liquid management. 800 mm Extension pipe for reflux still or rectification mode operation, fitted by 2 sanitary tri-clamp flanges on both sides. Quick-relies (push to connect) cooling water connectors. Heavy-Duty water pipes and tap water connection with clamps. Please note: This listing for copper reflux column only. Boiler and Parrot are not included. 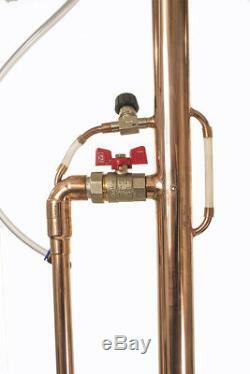 For our compatible boilers and extensions please look our other listings. Measurements: Pipe with dephlegmator and collection point: diameter-42. Length-800 in millimetres Extension pipe: diameter-42, Length-800 in millimeters Dimroth type detachable deplegmator: Length-300 in millimetres Removable copper Liebig condenser: outer pipe: Length-600, Outer pipe diameter-28, Inner pipe diameter-22 in millimetres Connection to boiler and extension pipe: 2 sanitary tri-clamps. Copper pipe with Bokakob type collection point and Dimroth type deplegmator Copper extension pipe Vapour management valve Two 2 sanitary tri-clamps with silicon gaskets Liquid management needle type valve Detachable Liebig condenser Water connection pipe Water connection fittings Quick relies(push to connect) water fittings. Our other items for sale. Please note that customers are responsible for the return costs of unwanted or wrongly ordered items. Please be advised that the following charges may apply for unwanted or wrongly ordered item. We will repair or replace the item at our discretion, and cover any reasonable costs incurred by the customer. We value your custom and your satisfaction, so if you have a problem or are not happy with your item, please message us first and give us the opportunity to rectify the issue. 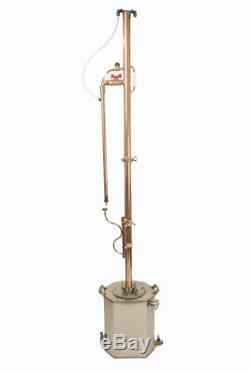 The item "2 Reflux copper rectification column 96.4 Alcohol Distiller, Moonshine Still" is in sale since Saturday, April 6, 2019. This item is in the category "Home, Furniture & DIY\Food & Drink\Beer & Wine Making". The seller is "okovit" and is located in Bury. This item can be shipped worldwide.